Isn’t everything in life uncertain to a certain degree? Becoming a young adult, becoming independent, and taking on new responsibilities of life all come with a lot of uncertainties and a lot of unknowns. This time of life causes anxiety for most. Now consider someone who is more vulnerable to those circumstances, someone who suffers from a real anxiety disorder. All of a sudden those “normal” uncertainties of young adult life become seemingly insurmountable roadblocks. The future becomes less hopeful, previous goals seem unachievable, and life appears dreary. This hopelessness often leads to avoidance, isolation, and oftentimes depression and worsened anxiety. Wouldn’t we all want to hide away if we felt it were impossible to achieve our goals or to tolerate the unknowns of life? What’s missing in this picture is skills, hope, support and alternatives. Society often expects adolescents to graduate from high school and just know how to transition into young adulthood. Young adults are expected to know how to take on all of life’s responsibilities, uncertainties, roadblocks, etc. without any real preparation. When they find they are not able to do this by their freshman year of college, they are considered to be experiencing a “failure to launch” into adulthood. They are seen as having failed to move forward in their lives. What I have learned after working with this population for several years is that these young adults are not actually failing at anything. They are stuck because their anxiety becomes so debilitating. The unknown and uncertainty becomes paralyzing. They are yearning for the right skills and support to assist them in launching forward, but often time end up turning to substances, video games, and isolation to cope. These negative coping skills perpetuate the “stuckness” and maintain this failure to launch syndrome. How can we help these young adults more successfully launch without so much despair and anxiety? 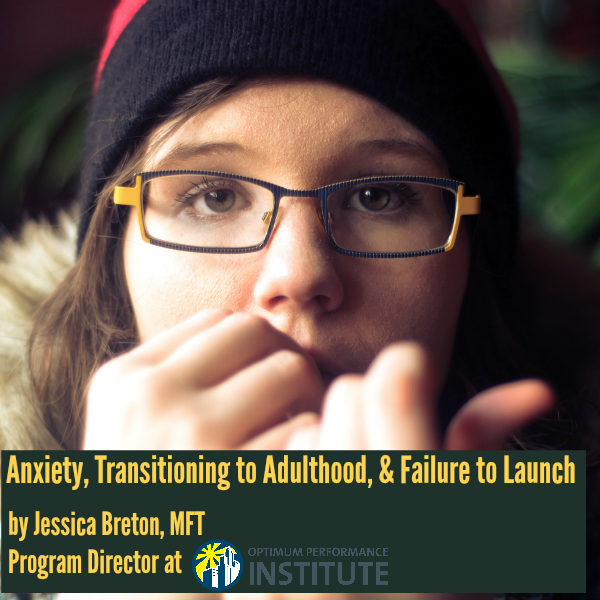 I see it being a combination of therapeutic tools and skills to manage their anxiety and support in learning how to navigate the independent young adult world. This can be done through life coaching, peer support, mentoring, or other avenues of teaching and coaching, all of which are offered here in our supportive setting at Optimum Performance Institute (OPI). What if we could also help make some aspects of their life a bit more certain or provide them with a greater sense of direction? If we can help them identify a passion, something that has meaning to them, and guide them towards fulfilling those passions, then naturally the level of their anxiety will gradually begin to decrease. We need to help them think outside of the box and to establish small concrete steps towards their goals. The smaller and more manageable the steps and goals, the more manageable their anxiety will be. Once we provide the skills and tools we then need to provide hope – hope that they can navigate the uncertain and rugged trek of life’s journey. The good news is, this is all possible. I see it every day here at OPI. For more information on OPI’s residential and outpatient programs and our measures to help young adults overcome anxiety that can lead to Failure to Launch issues, call us at (888) 814-5985 or click HERE to submit an online form. We’ll be in touch promptly.